All you’ll ever need to know about outfitting your child with hockey gear from skates to helmets (and all points in between). So you’ve decided to take the cold water plunge and sign your kid up for hockey this fall. The following is a step-by-step guide for suiting up little Linden or Taylor before the puck drops in October. Perfect for rookie and veteran hockey parents, this guide will get your kid on the ice, faster and safer than ever before. Skates are the most critical piece of equipment for any player. Hockey is played on ice and skates are a player’s primary source of mobility. What is the correct skate model? Has the skate been sharpened to the right profile? Has the skate been heat-molded? The comfort part is easy. If your child isn’t bellowing out in pain when the skates are on his feet, chances are the fit is okay. When it comes to size, leaving a little growing room is fine (no more than a ½ size), but make sure the boot isn’t too big or your kid will be wobbling all over the ice and will have difficulty learning how to skate properly. To ensure stability and comfort, tighten from bottom to top as shown above. The last thing you’ll want to check before you leave the shop is the blade’s hollow radius. That means the amount of steel that is biting into the ice. 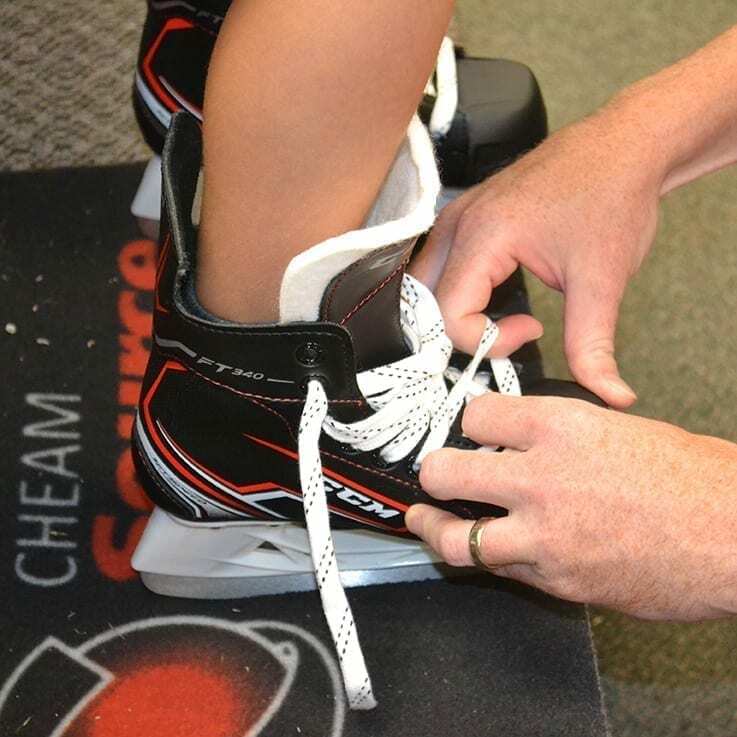 For beginners, you’ll want to select a deeper hollow (typically ⅜”) so that the skate has more “bite” so your child won’t be slipping and sliding all over the ice. Hockey sticks are a player’s second most important tool of the trade. For accurate shooting, passing, checking, and stick-handling, it is essential that your child select the right stick. Does your kid shoot left or right? How how tall are they? Each material has pros and cons, but for the sake of your wallet, it’s okay to stick to the bargain bin sticks for the time being while your child gets more experience. A stick that comes up to just below the chin (while your kid is on skates) is the general rule of thumb. As your child progresses in hockey, their stick preferences will change depending on their position. Defenders tend to like long sticks while forwards tend to prefer shorter, lighter sticks. Sticks come out of the factory in 4 overall sizes, youth, junior, intermediate and senior. The child’s weight will determine the flex of the stick for best performance. As the child progresses in the sports, their preference will become more evident. Stick weight is usually not as crucial for junior players as it is for more experienced players. Forwards tend toward lighter sticks while defensemen prefer heavier, longer sticks for checking and defending. These are the most important things to consider when outfitting a beginner in the game. 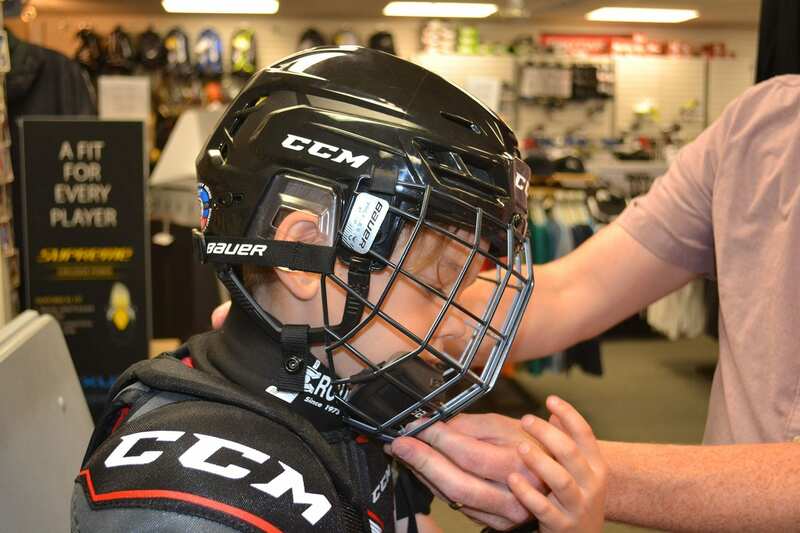 In an era where a lot of talk has been around head safety, it’s imperative that your child is fitted with a helmet that will provide the maximum degree of protection while on the ice. Is the helmet too big (or too small)? Is the cage you bought the right size for the child’s face? The most critical element of fitting your child with a hockey helmet is selecting the right size. Most new helmets are two-piece adjustable which means you can customize the fitting right there in the store. If it’s too loose, the helmet will lose its effectiveness, and if it’s too tight, it can be very uncomfortable. It is important to know that helmets do not prevent concussions. Their primary purpose is to prevent skull fractures. Concussions are caused by rotational forces, not blunt impact, meaning you can get a concussion without any direct contact with the head. Helmet companies have done lot’s of research trying to develop a helmet that prevents concussion; no such product exists on the market at present. After you have your child’s helmet, stick and skates selected, you can now start outfitting the rest of the protective equipment. Does the knee sit in the knee pad? Does your child wear the pad over or under the tongue? 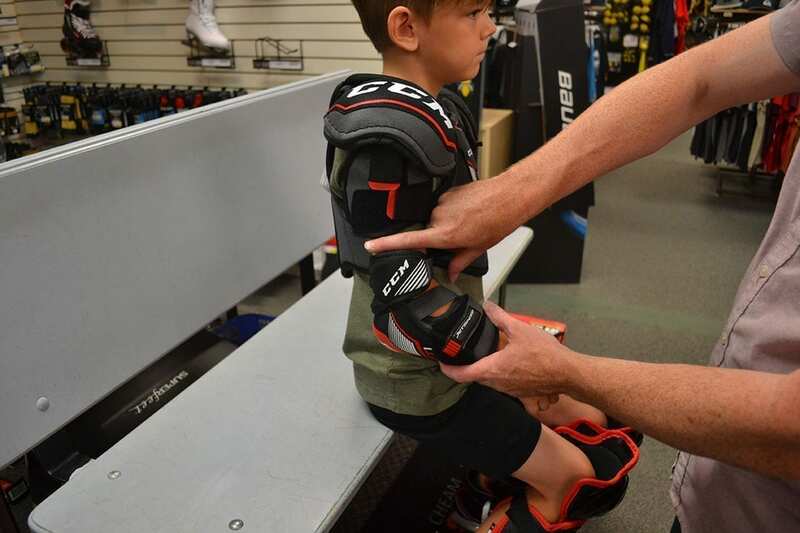 To best fit your child with a set of shin pads, measure from the centre of the kneecap to the top of the skate boot. Make sure the player is sitting down for this. Then select a shin guard that matches the length of this measurement. Check to see that the centre of the knee cap fits right in the centre of the cap of the knee pad and the calf padding wraps nicely around the back of the calf. Elbow pads serve many different functions. They protect the elbow and lower arms from impact against the boards as well as falls on the ice (there’ll be plenty of these while your child learns to skate). An elbow pad also helps protect against slashes and other errant stick movements that happen during a game or practice. Does the pad stay in place when moving? Does the pad fit snuggly? Is the pad long enough to reach the glove (but not past) when the glove is on? 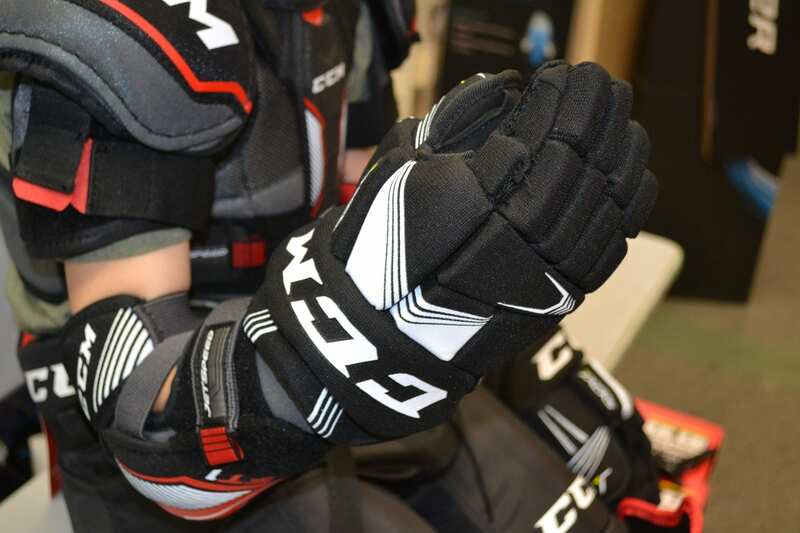 Elbow pads are fitted for comfort, but they should also be snug, not allowing for slippage during the quick movements typical of playing hockey. For maximum mobility, the elbow should fit squarely in the cup of that pad. Without restricting movements, the top of the pad should be high enough to protect the bicep. The lower part of the pad should be long enough to protect the forearm without reaching too far into the glove cuff. Test for any restriction by testing the child’s range of motion, bend the arm at the elbow to make sure there is enough space to flex naturally. Hockey gloves are necessary to protect your child’s hands from errant sticks and pucks during practice and games. They will also help protect the hands from the tumbles to the ice that are inevitable in the game of hockey. Are fingers close to the end of the glove , but with growing room? Can they pick up a stick off the floor (this happens on the ice all the time)? Glove size is based on the measurement from the flex of the inner elbow to the base of your fingers. If this distance is 15” then the size of the glove you’ll need is a 15”. Because hand shape is different from child-to-child, it’s vital that you try on a few different brands until you find the right fit. Leave a ¼” space at the end of the fingers in make sure the flex of the wrist lines up with the flex of the glove. Using a combination of plastics and high-density shoulder pads cover and protect many critical areas in the upper body such as the sternum, biceps, ribcage, collarbone and (of course) the shoulders. Does the shoulder pad cover the sternum? Does it fit snuggly around the neckline? 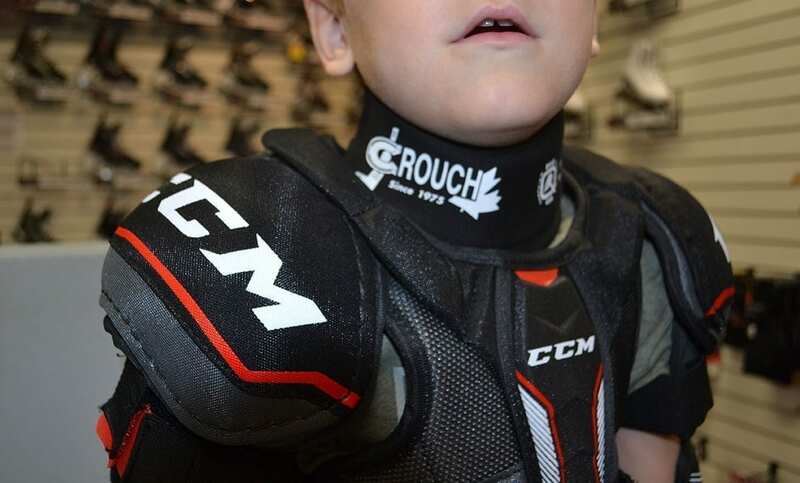 Just like with elbow and shin guards, each shoulder should rest right in the centre of each pad’s cup. It should also cover the entirety of the rib cage and collar bone. However, it’s not necessary to cover the whole stomach as hockey pants are designed to cover the lower half of the abdomen. Nothing is more important the protecting the region down there. Is the size right for the age? Do they fit comfortably inside the compression shorts? Designed primarily to protect your child’s thighs, hips/kidneys and tailbones, hockey pants ward off the punishing effects of hits, slashes, pucks and fall to high-risk areas of the body. Pants are manufactured using armoured plastic and foam padding with a nylon shell. Are the pants too long (optimal fit is mid knee for growth)? Is the waist snug, but not too tight? Pants should fit snugly around the waist, however, not too tight as to lose mobility and cause discomfort. Each brand will have a different fit and feel and most come in a standard S-M-L format. The bottom of the pants should rest—while the player is standing—around the centre of the knee. It’s essential that they’re not too short or protects above the knee is lost, too long and mobility becomes an issue. In the unlikely event that an errant skate blade comes in contact with the throat area, the neck guard is there to protect. 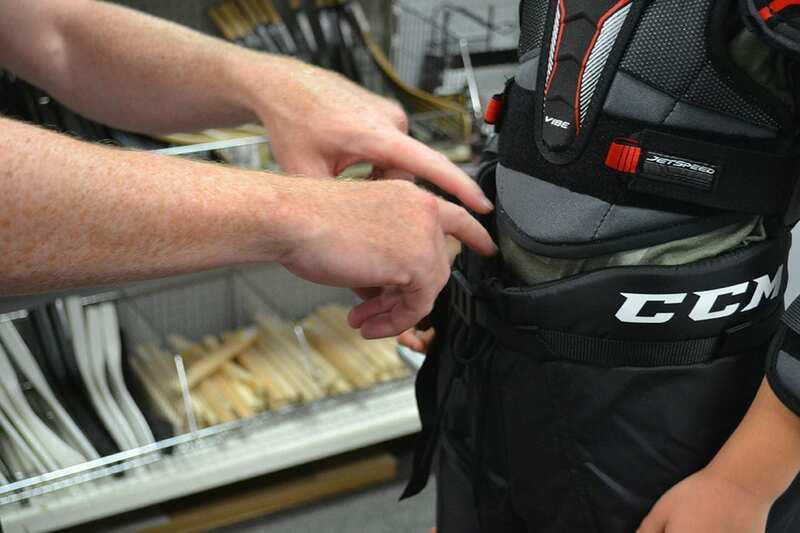 Did you know the neck guard is for stopping blades from cutting, not from the impact of pucks? Is the guard too tight?